CARMEL, Calif. – July 11, 2017 – Celebrated automotive artist Tony Sikorski is bringing the spirit of the holiday season early this year to the Automotive Fine Arts Society (AFAS) exhibit during the Pebble Beach Concours d’Elegance on Aug. 20, 2017, from 9:00 a.m. to 4:30 p.m., in Carmel, California. 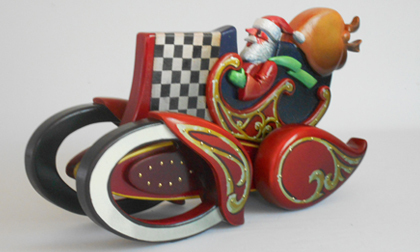 Sikorski will debut a collection of festive, holiday wood sculptures featuring St. Nicholas piloting an assortment of vehicles, as well as an airplane. 2017 marks the 22nd year that Lincoln Motor Company will sponsor the AFAS at the Pebble Beach Concours d’Elegance. Sikorski’s holiday sculpture series is beautifully handcrafted from wood and hand painted with precision and delicate detail. The six sculptures that will be displayed each feature Santa Claus behind the wheel of a classic vehicle with a sack full of presents. Among the featured vehicles is a Christmas-red Ferrari that is reminiscent of the quintessential post-war models like the ’53 Ferrari Testarossa. Also included in the collection is Santa Claus in a biplane and truck. The sculptures range in length from 16-inches to 21-inches each. Commissioned by corporations and private collectors worldwide, Sikorski’s talents have been highly sought after since his career began in 1963, when he won a scholarship to the Ivy Art Institute of Graphic Design in Pittsburgh. His work has earned recognition from outlets such as Car Collector, Robb Report, Mobilia, Automobile Magazine and AutoWeek. Sikorski’s illustrious career includes multiple awards including first place at the Midwest Concours d’ Elegance, the Award of Excellence for three consecutive years from the Gilmore Classic Car Museum’s Concours, as well as the coveted John Burgess Award: Best Show at the Daimler Chrysler Meadow Brook Historic Races. For more information about Tony Sikorski’s art, visit his AFAS website page here.